Size: 8.4" x 6.2" x 2.5"
This desktop calculator is nothing else than a restyled TI-4000. Compare it for your own. You'll find a similar change of the appearence with the TI-3500 and the later TI-340. 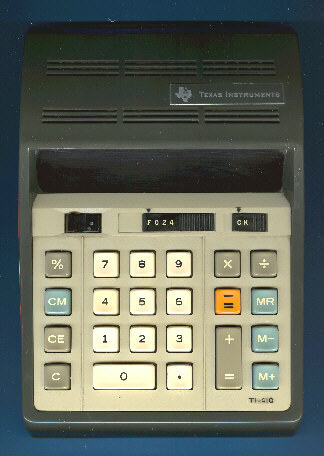 A later version of the TI-410 changed the color of the two sliding knobes. Don't miss the second TI-410. © Joerg Woerner, December 14, 2002. No reprints without written permission.